In addition, each country has different agro-ecological regions that support the production capacity of various commodities. For instance, some regions are associated with horticulture while other are known for fruits and yet others famous for livestock. This categorization provides a broader picture showing the way supplies of different commodities can be organized. Some regions have high production capacity for specific commodities. Regions with lower production capacity for particular commodities are the demand targets, ensuring better returns locally. Once a commodity is in abundance, it does not have a market where it is produced abundantly. For instance, in Zimbabwe bananas do not have a market in Honde Valley. Who are the customers for different commodities? We cannot say everyone is willing and able to afford an orange. That is why consumers are defined by class, gender, location, age, ethnicity, religion, income class and other factors. Not everyone wants to consume small grains, even if they may have income to afford small grains. That is why consumers have to be carefully categorized in order to create a food basket for different classes of consumers. It is not just about importing food without understanding consumers. If you are going to import wheat or grapes, which consumer group are you targeting? Otherwise, you can spend foreign currency importing commodities for a small class of consumers who can even afford to import their own food. In a poor country like Zimbabwe how many consumers are interested in the importation of wheat? An important second action is determining steps being taken to ensure commodities move from high production areas to low production areas before we rush to import. 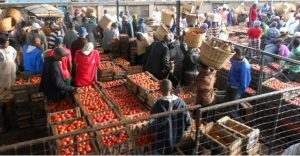 Managing the national distribution of food can translate to best return on investment (ROI) and ensure we tackle issues like nutrition and food security that ultimately affect the national budget if not handled properly. As we distribute food, we need to rationalize food availability through equitable wealth and nutrition distribution in the form of food. It is not ideal to leave communities in Binga consuming fish, those in Honde Valley consuming bananas and those in Chivi just surviving on small grains. This entry was posted in Agricultural Intelligence, Agricultural Markets, eMKambo, health and agriculture. Bookmark the permalink.